It’s time to review my online income report from last month. This report only includes income I received from the month of July. If I haven’t received the money, then I don’t put it in this income report. This is the best way for me to track how much money I am making on a monthly basis. While this is the best way for me to track my income, it’s also an annoying method. I say this every month, but a good amount of my income is paid out anywhere from 30-90 days after the work is done. So even though I am sharing this income report for July, only some of the income is actually from July and the rest was earned in April and May. July was my ninth month freelancing full time. It feels like a lifetime ago I quit my job, moved across the country to Nashville and now work for myself. Starting this blog has changed my life, it's just crazy! One of the top questions I receive each week is how I get so many pageviews. I tell everyone that it’s 90-95% traffic from Pinterest – which is true. I’ve figured out how to master Pinterest for my blog and have been helping clients for several months with my Pinterest management company. If you want to grow your traffic or start utilizing Pinterest, my Pinterest Presence course details EXACTLY how I’ve grown my traffic. Crazy, right?! I actually though I was going to be in more of the $7,500 – $8,000 range. Turns out I TOTALLY FORGOT about two affiliate payouts. When I received both paychecks in my PayPal account, I was like holy crap, where did this come from?! Um yeah, I had income pending from May that I totally forgot to write down. Jeez, I am like the worst!! I know I'm scatter brained, but not cool Kristin, not cool. Overall, July was weird. Everyone says that things slow down in the summer. This is my first real summer where I have had steady income going into summer, and I did feel the drop off in terms of traffic. But what's weird is that my income has been better the past couple months and increasing. I think I'm experiencing growth because I'm still a newer-ish blogger, but feeling some drop off because it's summer. It's weird. I don't know how to explain it. The month of July was quiet. I spent about 6-8 hours on my blog a week. This includes writing a blog post, responding to comments, scheduling my Pinterest, doing emails, posting to Instagram, etc. This obviously doesn't include any client work nor does it include any projects I'm working on, like things related to my courses, working on upcoming projects, etc. My blog feels like it's on autopilot. For months, I was spending a lot of time working on things to get to this point, and right now I feel like my blog is just cruising along with very little work to the site itself. That makes me feel like I'm doing something wrong. Of course, this was short lasting in July and seems to be a one-off. It's weird to feel like I'm not working but getting paid. Again, a lot of my income was earned a couple months ago and I was just waiting for the payout, but still. In July, I enjoyed the downtime because somehow this month (August) has become totally nuts. I am SUPER happy about my income. I've been working so hard to put things in place and it's really been paying off the past few months, especially when it comes to increasing my affiliate income and creating courses. I'm trying to enjoy it and recognize that hard work pays off, but didn't expect to get here. Ha! If you are thinking about starting a blog, this tutorial will help you start a blog today. You’ll also get a FREE domain name for a year! I was able to quit my job and blog full time, all within my first year of blogging. I am really glad I took a chance and started a blog! I invested around $100 to start my blog using Bluehost, and I made $13,000 in 6 months of blogging. That’s the best return of investment ever! While I've had opportunities to take on more clients, I've really been strict on myself when it comes to how many clients I accept each month. In July, I really thought a lot about my freelance clients and where I envision myself in the next 3-6 months. I love having clients, but I also like doing my own thing for my own brand. I've actually shaken things up quite a bit, and my August income report is going to look a lot different. I spent a lot of time in July in my own bubble. I've bunkered down a lot this summer and am busy trying to figure out what I want to do for the rest of the year in terms of my blog. There's a lot to think about! At the end of January, I launched my book about side hustling. I have done very little promotion of this book and still get sales. I converted this book into a course and did a soft launch this summer to test it out. I'm pretty happy with the results and plan to promote it harder this fall. You can check out the course here if you are interested in making extra income on the side. At the end of April, I launched my Pinterest Presence course. I share exactly how I run my Pinterest management services, but the course allows students to go at their own pace. The main reason I created the course was because I’m not able to assist every client that wants to hire me and this is the next best thing. 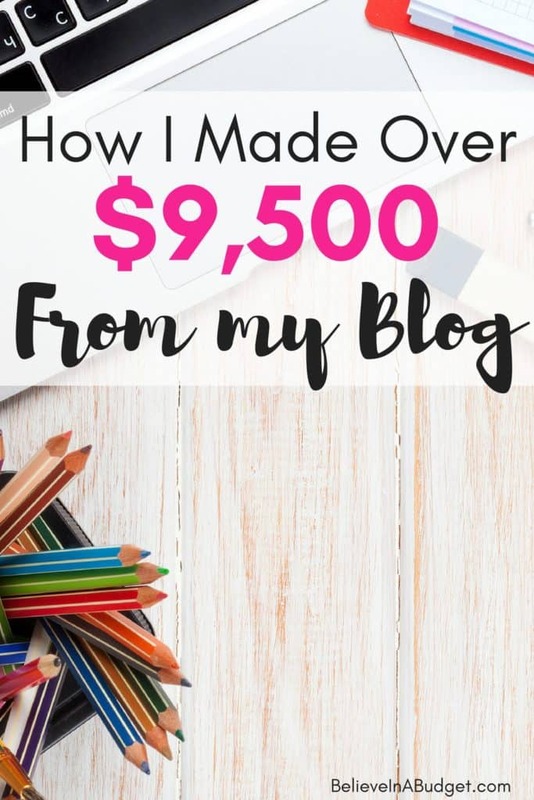 In the Pinterest Presence course, I share exactly how I went from 1,000 page views a month to 160,000 page views a month and how Pinterest drives in 90% of my traffic each month. I am really happy with the outcome of this course as well! There's over four hours of video included, cheat sheets, downloads, tutorials – basically everything someone could need to rock Pinterest. If you have yet to utilize Pinterest and also need to get more traffic to your website, you can check out the course here. This income report does NOT include any consulting income that I make that is related to my career niche outside of this blog. Even though this income is made online, it’s not really related to the blog, so I don’t share the income. In July, I skipped all real life consulting. I wanted some down time and enjoyed it. I really like what I went to school for and have been in the same line of work for about 12 years now. I enjoy getting to do some consulting, and like that it's totally different and not related to the blog. I'm all about the balance! $19.95 FreshBooks – I used the free 30 day trial and LOVED FreshBooks. I just signed up for the monthly plan and it’s seriously saving me so much money each month when I invoice clients. I don’t know why I didn’t do this several months ago? When I think about how much money I could have saved, I get so annoyed, ha! Seriously, if you are a freelancer and you use PayPal to invoice clients – STOP. Switch to FreshBooks. You will pay like 50 cents per transaction as opposed to 3-4% in fees. That’s crazy! This month my expenses were around 11% of my budget. I try to take care of a lot of things on my own so I don't have to outsource. I am ok with all my expenses listed above and wouldn't really do anything different. Using ConvertKit and LeadPages together has been amazing. I’ve created some really great newsletters, course sequences and sign up forms, and LeadPages has skyrocketed my email subscriber list. *Please note, I don’t include Tailwind or Bluehost in these expenses as I have prepaid for the year. Tailwind is the scheduler I use when I do all my pinning on Pinterest. How was your summer? Have you seen an increase or decrease when it comes to earning income? Hey Kristin! Thank you so much for sharing this, it’s great to know your blog is on auto-pilot now – such a wonderful feeling, I bet! I was curious what affiliate programs you’re using? I’m just getting started with affiliate marketing, and trying to get all the advice I can 🙂 Thanks in advance! Great job Kristin! Blogging is one of the may great ways to earn a lucrative income. I am interested in purchasing the side hustle course however, I am from the Caribbean so I’m not sure if most of the content will apply to U.S. citizens only. I will really like to make extra income to start my studies, purchase a car and for the Christmas. I know it involves, surveys, apps etc and most time these are not for non U.S. persons. Your assistance will be greatly appreciated. Hi Kerry! I just emailed you about the course. Most of the side hustles are probably US based, so I’m not sure how helpful it will be. It will be able to give you a TON of ideas on side hustles you could look for in the Caribbean to see if they are available. I don’t want you to pay for something that might not be applicable, so I emailed you a coupon to try the course for free! I will go through the course and let you know how things turned out.